Hairstory Studio, 95 5th Avenue, N.Y.C. “You actually don’t need the conditioner unless you shampoo to strip your hair,” says Eli Halliwell of Hairstory. Moreover, he’s fully aware that these may be fighting words, but they add new meaning to “wash and go” with Hairstory’s New Wash. Plus, there’s a simple logic to hair washing, but we’ll get into that a little later. It’s a new hair washing concept. There were two big bets, two significant challenges Halliwell needed to answer for himself. One, could you create a product that would clean people’s hair without detergent? Yes. Two, would people buy into that? “People think, The more cleansing of the hair we do, the better. Wrong! Shampooing strips the hair of all essential oils. We keep the good stuff but take away the dirt and leave a protective barrier,” Halliwell explains. For this young C.E.O. who’s been around hair products for decades, the original sin for hair is overstripping it. Hairstory New Wash is a universal hair-washing compound meant to replace your shampoo and conditioner, promising to restore hair to its natural, non-chemicalized state. However, after some trials, Halliwell became aware that when it comes to hair, one size does not fit all. So out came Deep, for oily types; Rich, for dry types; and the original formula for normal hair now offered in three different variations. As a consumer and a reporter, I had to put New Wash through a few weeks of testing, of course. I have very long hair—almost down to my waist—and, to my surprise, I did not need to condition my hair. Not even the ends. Granted, you must have a little more patience in the shower, because the composition is on the dense side, so you must work it into your scalp and down to the ends. Then allow it to sit there for a minute or two before combing it out, and follow with a rinse. I also found that New Wash works on psoriasis! My husband suffers from it, but only when he is stressed. After four weeks of use, there was not one flake on his shoulders, even when he felt strained. Bottom line: New Wash delivers what it promises, and now I am a convert. Not your ordinary business model. “You won’t find us on Amazon. You won’t see us in any retail outlets. It’s only through our Web site, and our entire focus was on hairstylists,” Halliwell says. Please explain! “By allowing hairdressers to be a part of e-commerce—meaning, through their recommendations and referrals, because they genuinely love the products, to clients, they earn a percentage of the sales. Plus, it’s a perpetual sales model. They are not only getting a percentage on their first sale, but any referred sales after that too. Smartphones have changed that landscape of retail to their detriment. 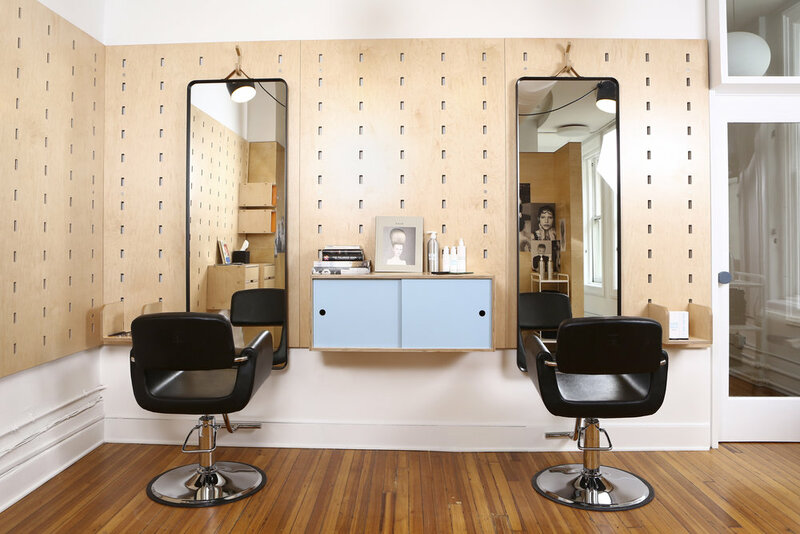 Over 50 percent of hairdressers now work for themselves, and this is happening all over the U.S.” He adds that 50 percent of their sales are through Hairstory online subscriptions. New Wash is also available in Canada, Europe, Australia, and New Zealand, and, soon, Hairstory fans and consumers will be able to read product labels and packaging messaging in their country’s language. The future looks like this. In the meantime, try out the new products from Hairstory: Lift, a versatile, hair-thickening, fast-vanishing styling mist without the weigh-down ($38); Wax, a shape-shifter that’s perfect for short hairstyles, and that’s hat-proof, not making hair feel rigid ($34); and Powder, a vegetable-and-mineral-based powder that puffs hair to new heights while extending hairstyles ($36). But first, you might want to check out their totally cool and humble abode, in the Flatiron district of N.Y.C., to test out the washes yourself. But be warned—you too may become a believer of New Wash, because those three little words, “two in one,” now have a whole new meaning, and then some. Hairstylist Jonathan Van Ness explains the New Wash concept.